ei7bfb 4806:02:26:58 Nothing heard on 145.990mhz from suitsat this pass. Mouse 4808:22:36:28 Received on handheld scanner with home made yagi. Heard data bursts with a voice in Russian. Mouse 4809:00:03:54 3 received on handscanner and an yagi on 437.800. Heard a few data bursts and then a male voice saying:_coming out the other way_. The rest of the voice was untintelligible as suit sat passed over. KA3JAW/4 4809:14:08:14 1 AO-54 Detected, Five second carrier, RF signal 1.05 db at 11:03:47 UTC on 145.990, FM, Ant. AZ: 045, EL: 037 deg. PD0RKC 4809:23:15:33 1 Good Signal, heard USA msg with special word FREEDOM! also weak SSTV picture, I will send audio to AJ3U site! KI6BGI 4810:11:16:45 1 At 75°, almost full quieting 2X _2 seconds apart, at 89°, man_s voice 2X, then girl_s voice *This is SuitSat 1*, Arrow antenna & Kenwood TH-F6A HT. KC5TRB 4810:12:45:30 1 Heard weak intermittent SSTV (not decodable). N9PSE 4810:20:40:08 1 Vy wk, unintelligible voice and doppler-shifted CW: 4 el yagi. TKS! KC8RAN 4810:20:40:51 2 HEARD _FREEDOM_ AT 21 DEG EL, RANGE 351.HEARD CW ID (RS0RS) AT 13 DEGREE ELEVATION WITH 9DB GAIN YAGI! DJ3AK 4810:22:02:47 2 ...RS0RS, then english female voice with special word on 145.990 FM at 47 degrees max elev. PD0RKC 4810:23:38:48 1 GREAT!!! Heard SUITSAT ID with telemetry and msg, I will send to AJ3U site! K1LEF 4811:14:39:52 1 Heard SSTV very faint. WB6KDH 4811:18:04:13 1 weak, with heavy QSB - _RS0RS_ ID, followed by male voice and quieting total of 39sec. 06:54:44utc, heard past zenith of 70º (57º), 4-element Yagi, VX-5R, no preamp. Still exciting to copy Suitsat, even though weak. PD0RKC 4811:22:28:13 1 Suitsat VOICE! CW and yes!! !-> long time SSTV (strong moments!). PD0RKC 4811:23:55:40 1 Heard SUITSAT voice (weak) but I have to analaze what language I_ve heard. YO8KGA 4812:01:32:44 2 14.02.2006 23:26UTC Partial ID and telemetry: mission time (01)5776 min, bat 26.5V. Rig FT847 - ant half F9FT (8el) at 60deg el. Audio files at _www.yo8kga.org_. KC5TRB 4812:11:58:49 1 Heard SSTV then female then male...weak & unintelligible. VK4IT 4812:15:45:25 2 SSTV heard on 145.990 for approx 15 seconds with minimal fading using VX7 and ARDF 2m Tape Measure Yagi. Elevation was 65 degrees tonight. KC8RAN 4812:19:56:08 2 Mr Smith is still alive, almost heard entire sstv sequence, but no picture. KA3JAW/4 4812:21:33:08 1 AO-54 Detected, Three very weak flutter carriers _ 03:25:30, 03:26:10, 03:26:50 UTC, RF strength 0.85 db, 145.990 MHZ, FM. KE5DFA 4813:10:46:03 1 Very weak, doppler carrier, only with slight traces of modulation 145.990 USB mode. VE6BLD 4813:15:41:01 3 I captured five 30 sec clips 1 min. apart. 2.18 with doppler,2.19 special word canada,2.20 english,2.21 foreign,max elev.44 degrees fairly good audio .See AJ3U. VIKING-DX CLUB 4813:17:16:48 1 Late report; Suit-Sat1 getting weaker. KC5TRB 4813:18:50:29 1 Heard weak female voice. KC5TRB 4814:11:10:32 2 Heard unintelligible female, a couple tones then male. VK4IT 4814:14:52:19 1 Bit of SSTV, female voice ident, then more voice, possibly _minutes_ and _volts_. Very faint, with deep fading using Arrow Yagi and VX7. Elevation was 80 degrees tonight. BD-PA 4814:19:00:00 1 Weak signal over Erie, PA- SSTV and voice, got about 90 seconds recorded, no telemetry. KG4ESJ 4814:19:04:41 1 extremely weak voice heard on 145.990 (unintelligible), followed by possible CCTV signal. KG4ESJ 4814:19:07:45 1 extremely weak voice heard on 145.990 (unintelligible), followed by possible CCTV signal. DJ3AK 4814:21:58:58 3 now with 2.3 wl yagi at 65degr. elev. : good receiption of voice THIS IS SUITSAT-1 AMATEUR RADIO STATION RS0RS, then weak female voice message on 145.990. TA1D 4815:02:37:11 1 I heard CW ID and SSTV puls with Doppler shift in SSB mode,but not readable in FM mode. KD4UYP 4815:11:21:53 1 Interesting audio signature this morning. got carrier most of the pass but could not make anything out (while live). did get 2 characters CW above the static..
KE5DFA 4815:11:32:42 1 I heard a weak Doppler shift carrier with traces of modulation 145.990 USB mode. VE6BLD 4815:11:41:33 1 Good morning again! At 06.17.31 and 19 degrees very very weak audio clips, more same at 06.18.09 and 28 degrees, then at 06.18.59 and 43 degrees cw id and fairly good full SSTV sequence!!. I will clean up and sent to AJ3U, then the last I heard was at 06. N2ECR 4815:19:23:53 2 Heard what sounded like Asian female (Japan?) then later heard SSTV data. 29.8 EL/183.1 AZ. Using an 8ft Vertical Omni. KA3JAW/4 4815:19:29:19 1 0 AO-54 (Suitsat) Detected, 145.990 FM, Signal 1.25, SSTV about 5 seconds in duration, 0525 UTC (0025 ET local). SQ9SY 4815:20:54:18 1 Traces of modulation (USB / 145.993-145.898) - fast doppler shift, max elevation was 83 degrees, antena - dipole + 20dB preamp. Nothing on FM. VIKING-DX 4816:08:46:34 1 Very weak. Elevation could have been better. KE5DFA 4816:10:22:15 1 Weak Doppler shift carrier with traces of modulation on 145.990 USB mode. KC5TRB 4816:10:26:55 2 Copied female voice that said _SuitSat_. W8PAT 4816:11:56:42 3 144.990 FM Strong enough today to be heard over S7 interference. M0JFE 4816:16:26:25 Very weak sstv tones folowed by in audioble speech Equip FT1500M & SQBM1000 co-linear. F6BYJ 4816:17:54:26 1 El max 79 - Force of the signals identical to the previous days. perceptible in SSB almost all length. KB9KX 4816:19:58:54 1 Weak Cw heard on 145.990 for about 15 -40 sec. KA3JAW/4 4816:20:01:03 1 0 AO-54 (Suitsat) Detected, 145.990 FM, RF Signal 0.75, slightly above noise floor with two .25 second carriers at 0454 UTC (2354 ET local). KB9KX 4816:21:35:39 1 Vry weak CW heard on 145.990. Could cpy R ,S , and zero. KH6UX 4817:04:28:24 1 Weak signal in the noise, 145.990. heard voices(perhaps Japanese) and the number _5_ in morse code. VE6BLD 4817:09:18:30 1 The pass at 8:37AM was only max elevation of 13 degrees..only copied very very weak of audio...gotta go to work. Paxton 4817:10:43:56 4 Heard several data bursts, also some odd pulsing sound that must be SSTV. VE6BLD 4817:12:12:09 yahoo!! !I have a good 22 sec clip including the special word for CANADA!!! Received at 5:31:38 at an elevation of 76 degrees with S9 +15 signals. I think this is my third special word! 73 to all from VE6BLD DO32. VE6BLD 4817:12:18:07 1 another very early morning from Lacombe, weak audio at 22 degrees at 5:30:30, go to AJ3U for files.waiting for next 78 degree pass!!! VE6BLD 4817:12:24:30 1 received more weak audio at 5:33:30AM. hard to copy voice.Check AJ3U for all my reception files. KB9KX 4817:15:41:38 1 Heard weak CW and callsign RS0RS in the noise on 437.800. WA5MUF 4817:18:39:36 1 Weak voice on 145.990.... Hey, who said airing dirty laundry was a bad idea? KA3JAW/4 4817:18:43:04 1 0 AO-54 (Suitsat) Detected on 145.990 FM, RF signal 1, heard three carrier burst about .5 seconds per burst. KG4DZN 4817:18:43:19 4 145.99mhz 6:13GMT Five 3 second clips 4 seconds apart- rotation fade? 1st clip full quieting girl_s voice ..1 amatuer radio station.. then 4 clips of Russian male voice. 4ele. beam 79 deg el. on 1200sq.ft. metal roof. DJ3AK 4817:20:02:17 2 voice saying THIS IS SUITSAT-1 on 145.990..
AI4JN 4817:21:44:19 1 Signal very faint, I couldn't make out message, I did hear transmission though. hg2ecz 4817:23:10:35 4 I heard a male voice and a doppler in SSB mode. The SuitSat come 2 minutes earlier than the predicted time (on this homepage)! My testantenna was a simple quad (+FT817) and the SuitSat flight just above our house. So I heard it only 2-3 second. VE6BLD 4818:09:20:54 the last pass was only 23 degrees . will send files from it to AJ3U after work today..I have to get some thing work done !! VE6BLD 4818:09:38:21 2 This pass was only 24 degree max elevation for me,,I copied cw id plus full sstv noisey signal(will clean up after wirk!) and 1 more weak message possible voltage?I will upload to AJ3U after work. JI7WPV 4818:09:56:58 2 Weak signal on 437.80MHz at 1500UTC. I heared Two packet bursts and Male voice about few seconds with QSB.Use GP antenna. AE0AL 4818:11:03:26 1 I am going to say I heard some unintelegable voices in the noise, but could defenitally tell they were voices. VE6BLD 4818:11:12:19 At 5.04 am great signals ,up to S9+20, deep fades, copied foreign special word I think and excellent copy third special word!! Please see AJ3U for audio files. more to come from next pass! 73. VE1MR 4818:12:37:18 5 Best signals yet, several voices and words. 1219 UTC heard start of SSTV. KD8CEO 4818:12:41:38 1 Very Weak Telemetry Burst. VE7TIL 4818:12:49:12 1 Again weak. However, there is a rapid nonlinear change in carrier freq when the signal 'just appears.' Noticed this on 3 bursts of signal on this pass. Same 20secondish bursts. 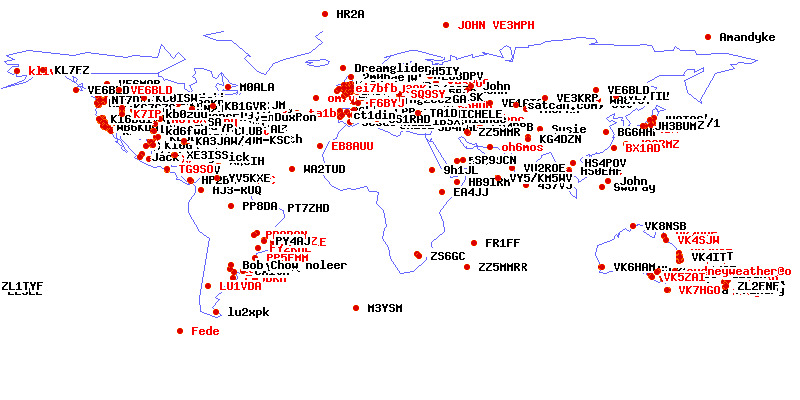 VE6BLD 4818:12:52:00 Strong S9+ signals ,copied two more special words, one in foreign language, go to AJ3U for audio files, I have now recieved three special words and most of the messages.Great fun!! James Balean 4818:14:49:10 5 Heard via ISS on 437.8MHz on low elev pass (16deg)! Quickly made my own antenna this afternoon just to hear it - excellent! No telemetry though. N4MIO 4818:15:05:38 1 Voice buried in the noise. ei7bfb 4818:15:37:03 Nothing on 145.990mhz, but S3-4 packet bursts with what sounded like an italian ham station testing? G7WIQ 4818:15:44:43 1 Very weak, but received distinctive doppler shift pattern on 6 consecutive passes using USB mode on 145.9885MHz and Spectran2 software. N7RVN 4818:15:57:52 Nothing on 145.00 and packet only on 437.800 (0258 CT) S2 signal on 437 with 75 degree pass. Things are looking bleak. KC0ETV 4818:15:58:38 On 437.8 Single Blurb heard. VE2AHD 4818:17:14:16 2 Reception of French Canadian Message and special word. DJ4XN 4818:17:14:53 4 145.990 no SuitSat but qrm by cable TV NDR S5 / 437.8 S4 Packet, telemetry, voice qso in spanish language. F/W2RSB 4818:17:15:31 1 Sub-audible male voice following by short burst of digital data with extreme fading. El 48 deg Az 230 deg. FT-60 w/Arrow ant. KB9KX 4818:17:29:46 4 9 packet bursts over 1min. period along with a male Russian voice for 1/2 sec. and someone calling CQ in English for 1 sec. EB2GWO 4818:17:50:53 4 6:07utc. 16º elevation. Got Russian message at 437.80 with packet burst. Lots of fade. CT1ESJ 4818:18:28:06 5 437.80MHz good copy, but some guys (G3 and F4 stations) use de ISS repeater to make some qso`s, absorving totaly de signal coming from Suitsat! NL0LPD 4818:18:43:58 1 Very weak SSTV Signal at 145.990Mhz. PD0RKC 4818:18:50:57 1 Still weak on 12 el circulair yagi. DJ3AK 4818:20:23:39 3 FM-transmission...this is suitsat-1 (female voice)... received on 145.990 with 70 degrees elev. PD0RKC 4818:20:26:59 1 A few seconds a very weak signal (with doppler effect). wb2udc 4818:20:47:27 1 very faint male voice and perhaps cw can't say it was authentic? WK0Q 4818:20:51:44 1 Finally heard weak signal during the 9:00AM central pass on 145.99 with signature spin fades and peaks but heard only a carrier, this was my first chance to hear it mobile. Using Hustler collinear into preamp. KE4HKS 4819:00:01:36 2 I have been monitoring sience around 3 pm eastern standard time , Feb 7th. At various times I have recieved static bursts. I did recieve a male voice around 3 pm edt but it was not understandable due to the static. I am using a discone anntenna. jk1zam 4819:00:49:43 1 very weak with QRM. head last two letter of ID. kd6wky 4819:06:47:30 1 Extremely weak signal, briefly above the background noise. TG9ADV 4819:08:16:20 2 Weak sstv signal on ssb x 5 secs, its good. KC0POC 4819:08:22:16 1 Used 437.800 repeater. Heard a couple packet bursts and on very muffled voice. JJ0HSC 4819:08:46:47 3 Intermittent Russian male voice from 437.8MHz. KD8CPP, Vandeve 4819:09:51:43 1 Very week signal. Paxton 4819:09:52:15 1 Choppy signal, garbled OM w/RR accnt heard on 437.8 MHz. KC5AMQ 4819:11:24:35 1 Possible male voice in static. VE5BLD 4819:11:26:22 First audio at 32 degrees,low level in noise, S9+20 at 73 degrees, clear audio for 35 seconds,check Aj3U for files!!! KC7VQR 4819:11:35:58 2 Heard two packet bursts on 437.8 and nothing on 145.990. VE7TIL 4819:11:38:36 1 Again rapid dopple shifted carrier with deep QSB, strongest signal yet here. Voice modulation but not strong enough for FM. 3 ele beam at 50 degrees el, 7 deg az. KI6BPY 4819:11:39:48 1 Might have heard one packet burried in static.Might have heard one packet buried in static. kd6fwd 4819:12:55:40 1 very faint carrier dopler drift. VE7TIL 4819:13:23:58 1 Very brief (~20sec) of very weak doppler shifted carrier, w/ deep QSB, No FM copy during peak of pass. Minimal modulation noted on carrier. 3 ele beam 45 deg el. 135 deg az. 9A7P 4819:15:36:40 1 Short bursts of packet on 437.800. Italian stations chatting on that frequency. ccastillo 4819:16:02:55 1 weak japanese words and packet radio in 437.790 MHZ. From Christian Castillo (SWL) Madrid - Spain. RX: Yupiteru MVT-7100 and Diamond RH-795 antenna. KC8CKZ 4819:16:14:30 1 0 0 12.0 Just heard a weak signal bleep via a Bearcat Scanner facing North exposure, only heard digital telematry. Bedford, Texas 4819:16:20:04 2 A couple of secs of static at 02:30 CST on 437.8 (also, several secs of static on 145.99 at 03:20 CST on 2/5/06) Both on handheld scanner-Thx for this experience! KE5DFA 4819:16:26:18 1 I heard a weak doppler effected carrier tonight in SSB mode tuned to 145.990 usb. John 4819:17:34:43 3 Suitsat Signal 437.800 (S3) and packet. DL8MAX-5>APC102,APRSAT,RS0ISS-3,IGATE : ,F4CEP-3>APRS,ARISS: : Please send not APRS to ISS!!!!!! N2TDI 4819:17:55:11 1 Four short packet bursts. KA3JAW/4 4819:17:58:20 1 0 AO-54 (Suitsat) Detected- RF signal 1 at 0700 UTC (0200 ET local) with two seconds of a fragmented male voice. nl5736 4819:17:58:34 3 2 my ant active tv ant,hrd about 3 minites.packet and voice. KG4WMG 4819:18:00:56 1 Very weak, heard scattered SSTV tones (didn't recieve a picture) and a faint voice fading in and out under the QRN. YO8SSQ 4819:18:07:24 1 Heard packet signal on 437,8. No signal from suitsat. KI4IIB 4819:19:07:01 1 Very weak signal, but could definitely tell there was something there. KB0ORZ 4819:21:08:49 2 Heard static with a constant beeping lasted for about 5 min. i0qm 4819:23:59:32 2 145990 KHz, weak but OK.
JH2DFJ 4820:05:15:15 A report of OHBIT#44 and #45. 145.99 are reception NG. A voice breaks off with a rash とspin because perhaps a satellite repeats a spin with 437.80. KG6IFV 4820:07:15:59 1 Heard both male/female voices and brief packet noise. Very weak signal. VE6BLD 4820:08:38:52 2 On the 9:06 pass this morning I copied more audio and TELEMETRY.Go to AJ3U for reports. K8YTW 4820:08:49:26 0 Heard male voice on 143.625...Switched to 145.990 and heard very weak sig doe about 20 seconds. NØVUB 4820:08:50:48 1 Very weak, could just hear voice. Did copy RS0RS. KB9KX 4820:08:53:53 1 Heard very weak CW for 1/2 sec to 1 sec on 145.990. KC4MCQ 4820:09:54:02 1 Heard very week signal. kb6mth 4820:10:13:00 1 SSTV signal briefly heard on two 1 second intervals at 0943 and 0945 local. Great work! N0JLB 4820:10:14:51 1 0 Very weak voice and CW. Using 437.800 Cross link. KC7OC 4820:10:14:55 2 Heard packet tx and male voice on 437.80. KI4MMT 4820:10:15:11 1 Heard faint female voice followed by faint male voice, both unintelligible, 145.99 signal lasted about 2 minutes. KG0QR 4820:10:26:04 1 Very weak voice in static, could not make out what was said. VE6BLD 4820:11:56:45 3 I received a pretty good SSTV picture .Uploaded to AJ3U. This is incredible fun!!! VE1 EJM 4820:11:56:52 1 Feb. 6/06, 13:02 UTC received very weak sst. Could not log on to submit report. KE7EYQ 4820:11:59:48 1 Heard 2 1-second bursts of carrier on 437.8, didn't sound like packet. VE6BLD 4820:12:01:17 4 Good 22 sec recording of girl.S4 with fading. Audio clip to AJ3U web site. WK0Q 4820:12:04:08 2 3:48:05AM central 2/6/2006. About 1sec of packet on 437.8, almost full quieting but no decode. Ant. is cheap tv bowtie into 10db preamp into pcr1000. VE7TIL 4820:12:04:38 1 Rapid doppler shifted carrier with modulation. Very weak with deep QSB. J-pole antenna and 4 ele beam. WK0Q 4820:12:06:43 2 3:48:05AM central 2/6/2006. About 1sec of packet, almost full quieting but no decode. Ant. is cheap tv bowtie into 10db preamp into pcr1000. VK2LL 4820:12:28:47 1 0 Cxr observed via SSB. Measured doppler @ 932Hz/min via Digipan. Nil hrd on FM. Nil hrd on 423MHz. KB9MFT 4820:15:09:31 3 Heard three or four data bursts on 437.80MHz, heard nothing on 145.99MHz. Using Yasue FT-530 with Rubberduck for 70cm band, Azden AZDEN PCS-2000 with 5/8-wave whip for 2-meter band. TA1D 4820:16:33:32 some ground stn signal across the ISS FT100D on 437.800 MHZ. KE5DFA 4820:16:33:54 1 I heard a weak Doppler Effect carrier with a trace of modulation at one point. W1XP 4820:16:43:51 1 Weak signal with abrupt fading. Most of the time to weak for FM detection. Using SSB mode to track carrier signal. Has bits of audio modulation at times. KB9KX 4820:16:44:48 1 Very weak CW on 145.990. KC8RAN 4820:16:47:50 1 heard girl's voice,but couldn't hear message. G1KSW 4820:17:59:27 1 Short data bursts. ? See www.g1ksw.co.uk for wav file. G6BHB 4820:18:06:01 2 Suitsat still alive, short burst of CW, carrier heard, deep fading. KB9KX 4820:18:17:50 1 I heard a single beep followed by a packet burst. Beta 4820:21:08:21 1 I only heard one single beep for half a second. BG6AHP 4820:22:27:31 2 Weak carrier signal from S2 to S3 about 2 second on 145.990 and strong carrier on 437.800,unreadable.ANT:9 EL 2m Yagi and10 EL 0.7m Yagi. Peppe Highlande 4820:22:48:23 1 Ascolto dei dati telemetrici,spettacolo! N9SGE 4821:02:50:41 Faint cw static voice. Great experiment w/ my children! Thanks! ZS6GC 4821:03:44:39 1 Signal on 145.985.3 USB. Freq changes due to doppler fast. VE6BLD 4821:05:43:10 13 7.0 I have sent reordings of audio including TELEMETRY to http://www.aj3u.com/blog/. WA2TUD 4821:05:51:01 2 Again, very weak. Just a beep on my radio. KD7SUU 4821:07:38:01 0 faint CW in USB mode. Some chattery sounding clicks. KD7SUU 4821:08:55:52 1 USB, Hr'd broken CW, brief garbled voice, clicks, nothing complete or discernable. KB0NPW 4821:09:10:15 1 Very weak. Faintly heard SSTV. Using Yaesu VX-7R with Cushcraft Ringo Ranger II vertical. Recorded audio. VE6BLD 4821:09:16:14 1 I received suitSat for the fourth time at08:39 local.Not as strong as last two.See http://www.aj3u.com/blog/ for recordings. W4WSR 4821:10:08:43 1 Some voice & SSTV heard. Peak strengths readable, but too short. QSB rate = 8 sec. VE2FDW 4821:10:25:02 1 SSB carrier in noise with doppler effect. Duration 3 sec. kc8lpm 4821:10:27:46 1 very weak, heard voice 1 sec. KC0TZS 4821:10:48:44 1 Heard a brief electronic signal, then nothing for about a minute, then, after fully opening squelch, could barely hear (but not make out) human voice in the heavy static. W4TME 4821:10:51:14 1 Maybe 1-2 seconds of carrier. RST 21 at best. Kat& KC8ZBK 4821:12:21:11 1 Weak SSTV signal heard. K0KGR 4821:12:23:39 No 145.99 sig. ISS 145.8 sig good. VK3KBV 4821:12:59:34 2 2 Very Faint tone with doppler 34deg. VK3KBV 4821:12:59:54 2 Very Faint tone with doppler 34deg. N6SPP//sfo area 4821:13:55:27 no sig S.S.// (ISS Sig:S8 packet 145.8//1052z 5feb. WB6KDH 4821:13:58:01 1 a few syllables of female voice, 10:55:27 UTC, 16º elevation. gp ant, no amp. KB1CVH 4821:14:01:51 1 1 sec weak audio, may be russian male voice. k1ilr 4821:14:57:09 1 Unable to decipher code because of weak signal; heard at 6:02-6:-03 a.m.
KI4MXY 4821:15:28:37 No signal heard. Thought I heard some carrier but no audio. Nick 4821:15:31:05 1 Brief beeping and digital sounding signal. W1XP 4821:15:31:18 1 In SSB mode heard carrier that had intervals of voice modulation. Peaked at max el. time. Lost about 3 min. early. CW would have been easy Q5 at max. signal. KE7FZV 4821:15:37:46 3 Short data burst ..recorded..some signal visable on meter after..Using M2 7 el. Beam Pointed South..
ZL2CIA 4821:15:59:30 1 heard for first time. Rig in cw mode. Carrier + Doppler heard. 4 ele ant. Short coax. N2ECR 4821:16:13:34 Only a distant male voice repeater ID heard, no suit. KB2ZOE 4821:16:28:47 2 got two bits of what sounded like a call sign, that came through strong but after that there was nothing....however I was listening on a radio shack htx-202 w/rubber duck only!!! G6BHB 4821:16:45:33 1 0 Very weak signal, heard 3 - 4 seconds of SSTV but unable to sync. PE1NUT 4821:16:53:42 1 Only heard two weak bursts, sounded like packet. K2MAH 4821:17:07:46 3 Only carrier heard for about 30 seconds. K7R42 4821:18:02:17 1 Very weak. KB3GUF 4821:18:09:12 2 Signal varying from S-2 to S-7 four times on 75 second intervals(spin rate?) Unreadable. JH2DFJ 4821:18:23:35 1 I tried ORBIT#1 to 3 of the Japanese sky, #12-18 reception, but catch a very weak signal seeming from a satellite when I reached MAX EL. However, I lose a noise and am impossible of decoding. F4EGX 4821:18:27:04 one or two seconds of carrying, with Doppler effect. Local QRM? Devotech 4821:18:39:39 1 Garbled voice or tone. Barely indistinguishable from the normal static. TG9ADV 4821:18:44:54 1 Very weak carrier signal on sstv by 4 secs. BL 4821:18:51:35 1 Elevation max 13 degreese. N5UYA 4821:19:47:42 1 Heard about 6 bursts of carrier over about 7-8 minutes. Longest lasting about 5 seconds. No modulation, just carrier. i0qm 4821:21:37:13 2 small carrier, then digi? w1ycz 4821:21:46:42 1 Very Weak Signal. Too poor to understand. wa6cde 4821:23:15:51 1 heard it at 1825z think I got the time messed up wrong for time sorry did recalc. w4tey 4822:00:37:51 5 20 aos about 7pm los on 990 about 7:15 pm shifting down in freq. ZS6GC 4822:02:37:00 1 Very faint voice signals and some digital sigal - sound like morse code. 5R8EW 4822:03:50:20 1 sqlch open tones cw and data bursts briefly.Ic-pcr1000+13el.Yag.+pre-ampl. VK5ZK 4822:06:05:00 1 Confirm weak voice(Russian). Brief bursts. Only 3deg elevation. 11 el hor Yagi SSB mode. kg6szw 4822:06:25:38 1 Consisten packet. ? KF9MA 4822:06:26:16 5 Brief bursts of packet like noise. N6SPP 4822:06:30:16 3 2 sec carrier/ ic746/Arrow Ant @ 1829z 4Feb//miniDisc rec. kc9esf 4822:07:01:26 1 couple tones, maybe sstv? K0KGR 4822:07:27:49 1 Only weak carrier. 145.8 packet fair. VE3NSV 4822:07:41:02 5 21 Packet bursts, great signal, have recording. KO4MH 4822:07:54:59 2 Heard 0.5sec data bursts every few secs in Kansas, USA on 145.815 MHz with 3el Yagi. Confirmed true signal by pointing direction tests and AOS/LOS times. NOLM 4822:07:57:43 1 Heard ~29 packet bursts (folks transmitting on ISS uplink freq? ), several carrier bursts and 2 locals transmitting on the downlink freq - thanks guys. WD8DAS 4822:07:58:13 3 Two short bursts of carrier well above the noise. Modulation was AFSK - possible SSTV transmission? FHU-AZ 4822:08:18:40 2 Broke sqlch often. I barely heard about 2 seconds of the message, something that said zero zero. Susie 4822:09:25:12 1 Three data beeps. Extremely weak voice detection unable to make out information.Base station scanner used. N5UYA 4822:09:29:30 1 Heard about 6 bursts of carrier over about 7-8 minutes. Longest lasting about 5 seconds. No modulation, just carrier. meder 4822:09:30:53 3 Short bursts 1-2/min on 145.990, good signal horizon to horizon. Nothing on 143.625. Scanner w/ducky! AB0RX 4822:09:31:27 1 Very Weak signal (poss SSTV) just above the noise. Recorded. K8RCZ 4822:09:32:00 3 Heard packet tx on 145.990 off the side of a 7element vertically polarized beam. Only heard when directly over head. AB2IZ 4822:09:32:43 1 Two beeps??? Otherwise nothing. W9KH 4822:09:33:13 1 2 long tones at1525, 2 short tones at 1533 utc.Have recording.5 el. yagi fixed to North. KG4QWC 4822:09:34:21 1 Weak audio peaks aroudn 420-Hz, VX5-R + Arrow ant. N3MVF 4822:09:35:58 4 My noise floor with preamp is S3. With ISS at 70-80 degree's, carrier on frequency went as high as S15. No voice. VE2GHO 4822:09:36:02 1 Heard very weak carrier with something that seems to be voice at 15:22 UTC and two tones signal for about 30 sec. at 15:23 UTC. Have a recording. ke6yrc 4822:09:39:10 1 squelch set off; 2 instances when white noise stopped momentarily, but not audio. Used 145.800 packet bursts as beacon. ve6bld 4822:09:41:58 3 0 I have a good recording of a girl and male voice! !KLM20 elem crossed with Landweir preamp!! KC7VQR 4822:11:04:02 1 Heard 3 beeps and couple words of French, but do not understand French. Had 28 elements faceing it. Thought some one was playing around, went back to bed. VE3NSV 4822:11:06:10 1 Heard a beep followed by a 2 secod carrier, have recording also. W9KH 4822:11:08:40 1 Heard 5 very faint beeps then nothing.Couldn't get the recorder started in time.Here's to hopin there's still life out there! K2GTM 4822:11:56:55 1 Recorded a weak beep at 8:10:54 EST over Buffalo, NY. K5FUN 4822:16:02:37 Nothing heard.It was right overhead. KW5CQ 4822:16:03:17 1 Heard very short disturbance but nothing intelligible. Saw what might have been a Kenwood re-entering, hi! KB9IOZ 4822:16:27:37 1 Nothing Intelligible heard after copious monitorring. G1KSW 4822:16:53:15 Nothing heard :( Very cold though. Do handsets work at 2.7K? g6did 4822:17:17:12 1 Slight fluctuations in background noise. Slight buzz and whistle. Listened to tape several times. Kaj and Japheth 4822:17:33:46 1 Very weak singnal, nothing discernable. E20ZFD 4822:19:55:45 Nothing in SQL. K2MAH 4822:20:41:46 I just read NASA says the SuitSat died after 2 orbits, bummer. HJ3-RUQ 4822:20:42:37 1 0 Ultra weak signal. No data at all. ZL1DT 4822:21:08:24 Not a sqeak! Nada! WB3IVX 4822:21:09:47 nothing in Pa.
K0NEB 4822:21:11:05 Nothing heard, hope for better in the morning. ZL1AOX 4822:21:14:01 1 Very weak signals detected withh SSB mode selected. Unable to decode anything useful. N3MMH 4822:21:23:25 1 Very weak sig, barely heard. JS6RMZ 4822:21:31:04 No signal, only slight break in sql. JA6BX 4822:21:39:40 Nothing Heard with 8el X-Yagi Ant. I4JUQ 4822:21:55:19 1 second only tx in a minute? is it operational? YO8TLC 4822:21:57:25 NO SIGNAL AT ALL. Very sorry! PB0AAQ 4822:21:59:50 02:57z EL:6.3 NoSignal Utrecht Vy Pity ! EB8AUU 4822:22:04:13 No signal over Canary Islands. EB8AUU 4822:22:04:24 No signal over Canary Islands. KI4MMZ 4822:22:08:26 1 just make out voice for approx two seconds using pre amp not positive ID sounded like W>D. PP5FMM 4822:22:18:59 No signal over BRAZIL - Sta Catarina isl. ZZ1ARE 4822:22:23:16 SORRY. NO SIGNAL. PY2RML 4822:22:24:11 Nothing here until now. TA1D 4822:23:27:39 1 vy pity vy poor signal not enought for picture copy.